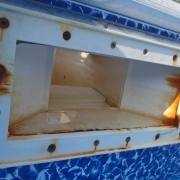 Leak Detection | APCO Pools Specialties, Inc.
FIRST TEST: With the filter running, put the water to the middle of the skimmer and mark the water line on the faceplate with a pencil or electrical tape. Monitor the level for 1-2 days. 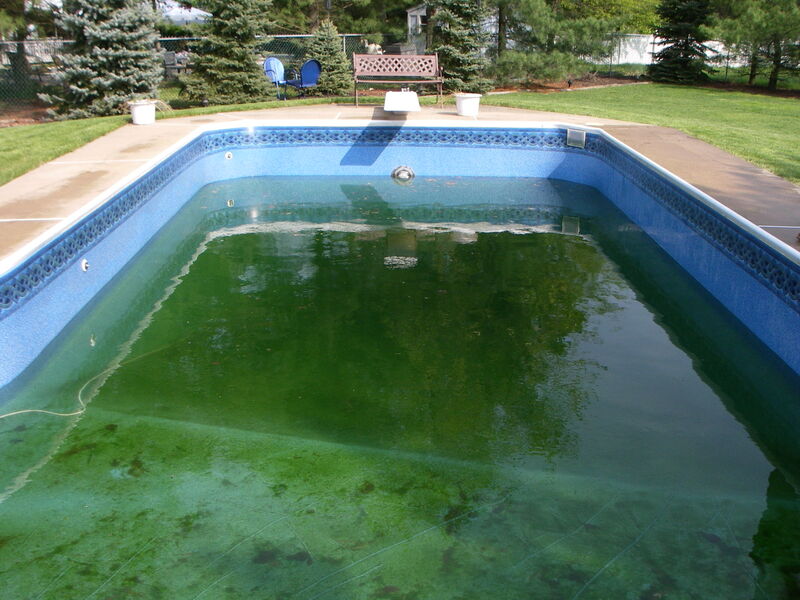 Do a visual check at the grass around the pool and the filtration area and see if there is any abnormal moisture or puddling. 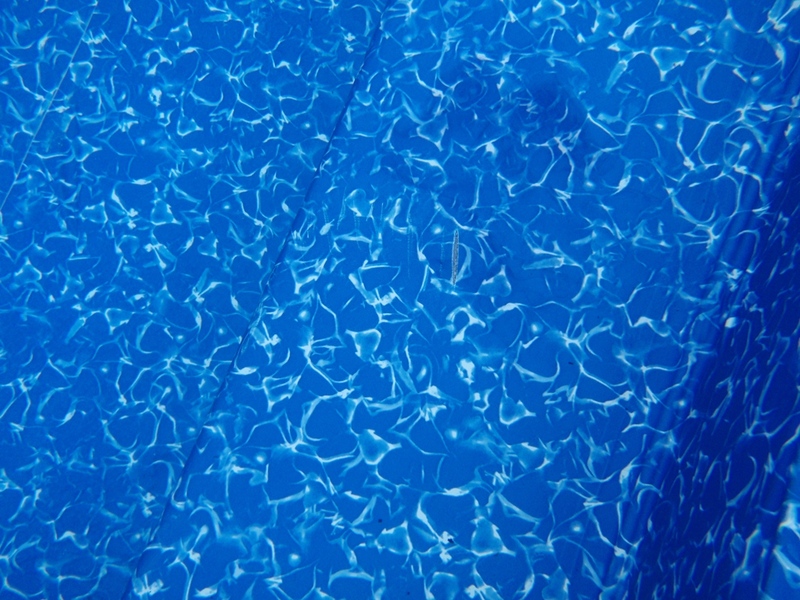 Normal evaporation should be no more than 1/8 to 1/4 inch a day depending on the time of year. 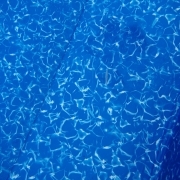 If the water level has dropped more than normal evaporation, you have confirmed that there is a leak in your pool. Record your data collection and start the second test. SECOND TEST: After confirming that there is a leak, go ahead and run the second test. 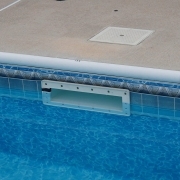 Shut off the filtration system and remove the timer tabs so the filtration will not kick on while the plugs are in. Plug all of the returns, the skimmer(s), vacuum line, and step jets. There should be no open plumbing lines. Repeat the first test again. 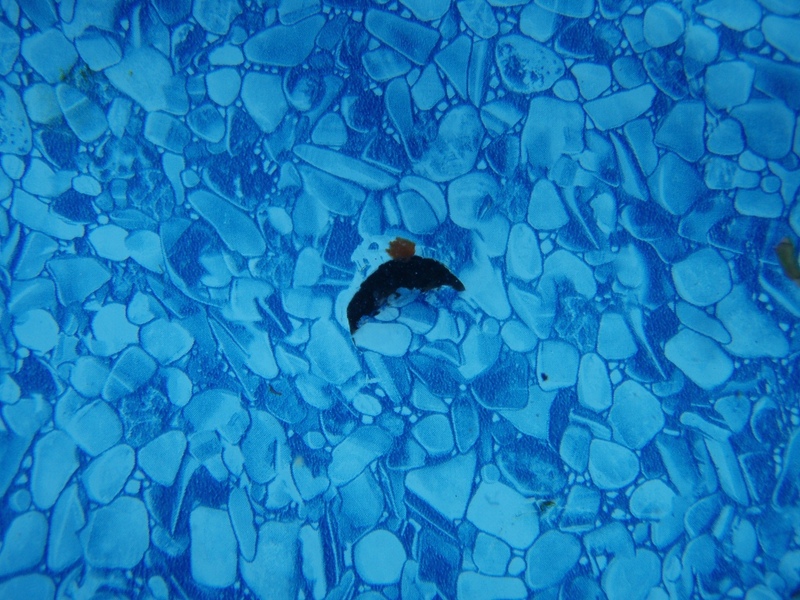 If the leak has stopped, than it is confirmed that the liner area is not leaking. There may be a problem in the plumbing lines or filtration area. 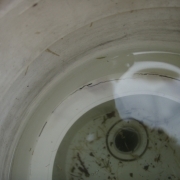 If you think it is in the plumbing lines, please give us a call to schedule a pressure check. 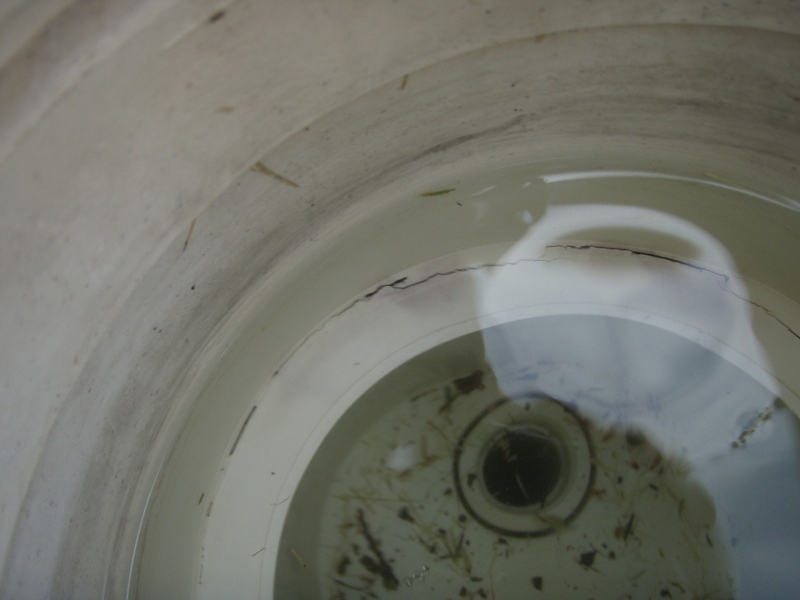 If the water loss is the same, than it is confirmed that the liner area is leaking. Proceed to the following photos to do visual inspections. 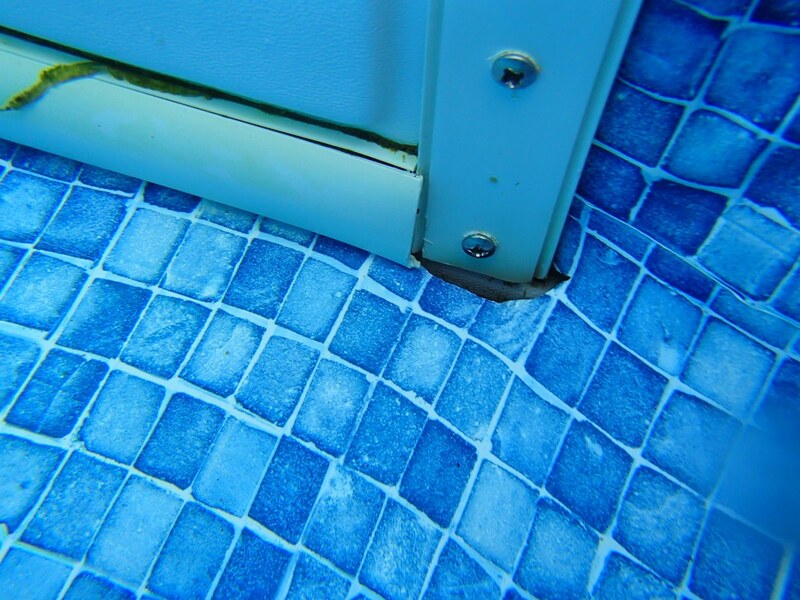 After checking the liner area and do not see any suspicious areas, please give us a call to set up a leak detection appointment. 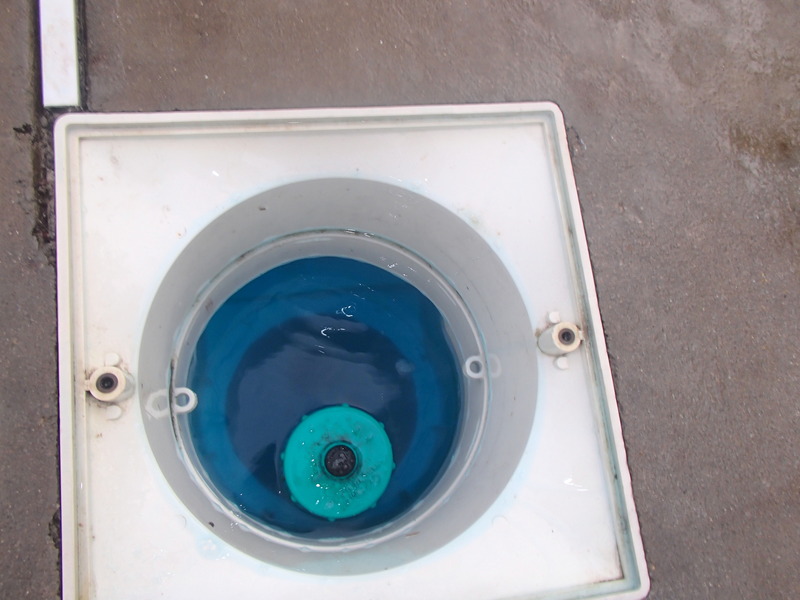 PART OF SECOND TEST: Plug skimmers with either Ultra-Gizzos or Black Winter Plugs. 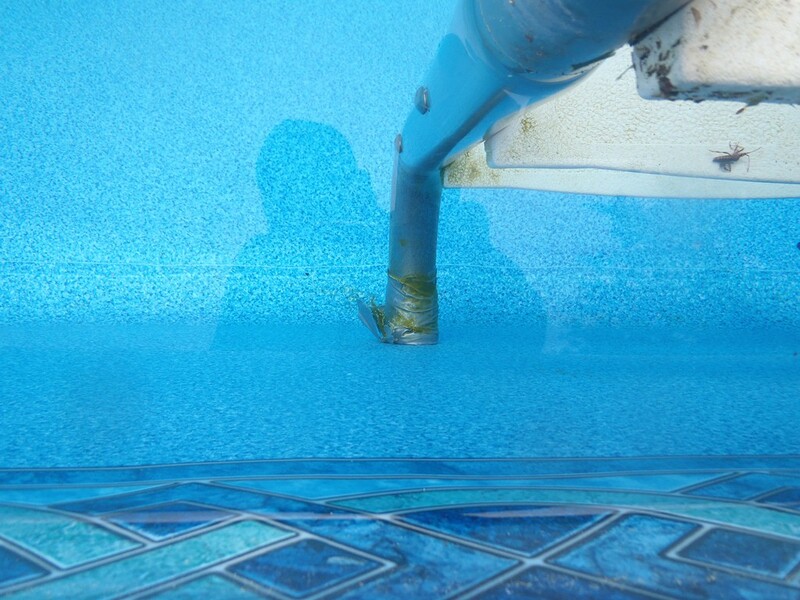 LIGHT LEAK: During the opening of a pool, if the water level went down to the level of the light, than most likely there is a light leak. There is a choice: Choice 1.) 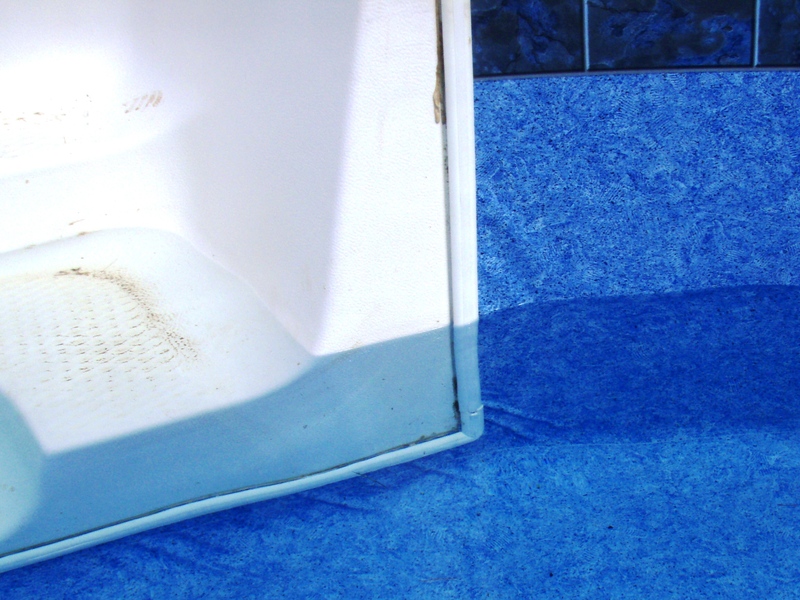 Give us a call and we could repair the leak in the light. 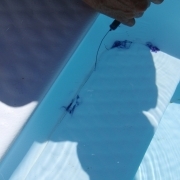 It is much easier to fix the light with the water level down. It is also less expensive. 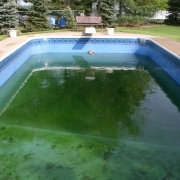 There is a possibility that the pool could still leak and we would have to do full leak detection. Choice 2.) 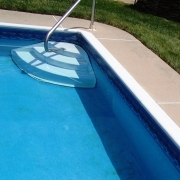 Fill the pool to the middle of the skimmer and give us a call. 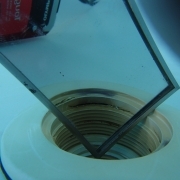 We could repair the light and if necessary, perform leak detection. This procedure is more time consuming, therefore, more costly. There may be more than one issue other than the light. 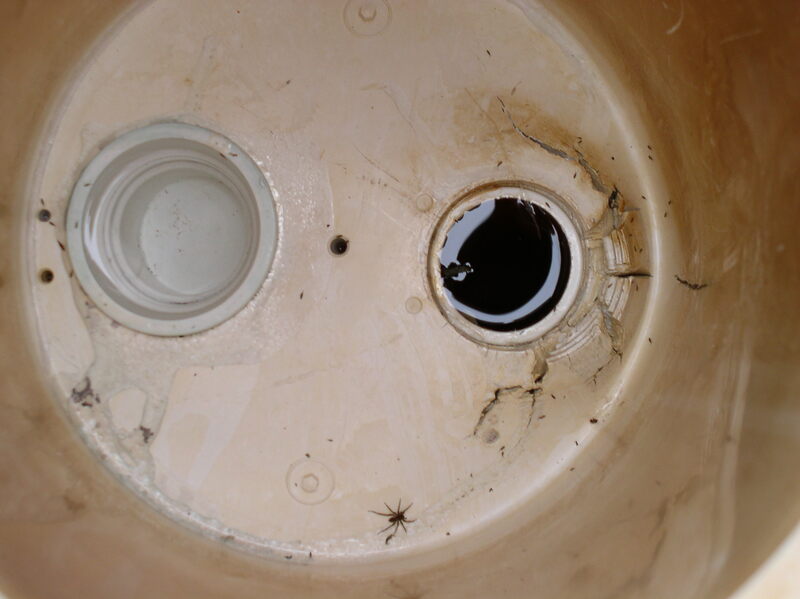 SKIMMER BUCKET: Cracks in skimmer bucket. 1.) 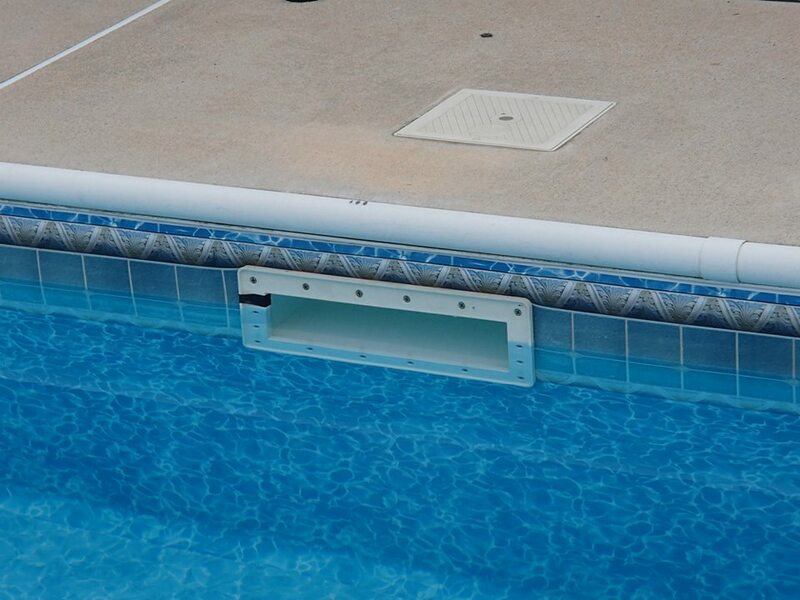 Remove skimmer basket. 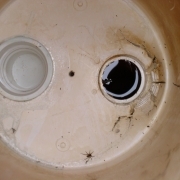 Look in bucket area and visually look for anything that looks suspicious. 2.) There may be a plug from a known leaking main drain that should be there but someone removed. 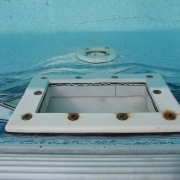 SKIMMER FACEPLATE AREA: Crack in skimmer and liner chemical damage below at skimmer faceplate. 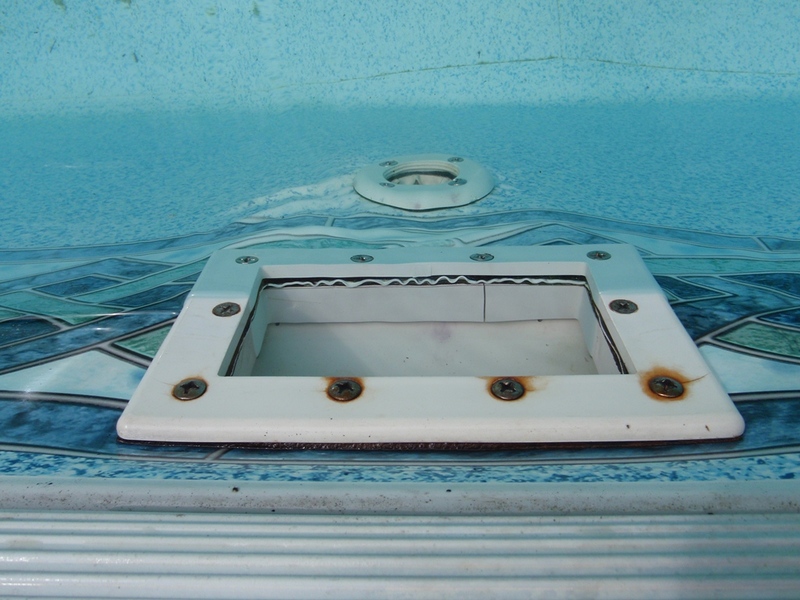 SKIMMER FACEPLATE AREA: Signs of rusty screws and skimmer bucket. Rust may be a pH problem. Maybe non-stainless steel screws were used. 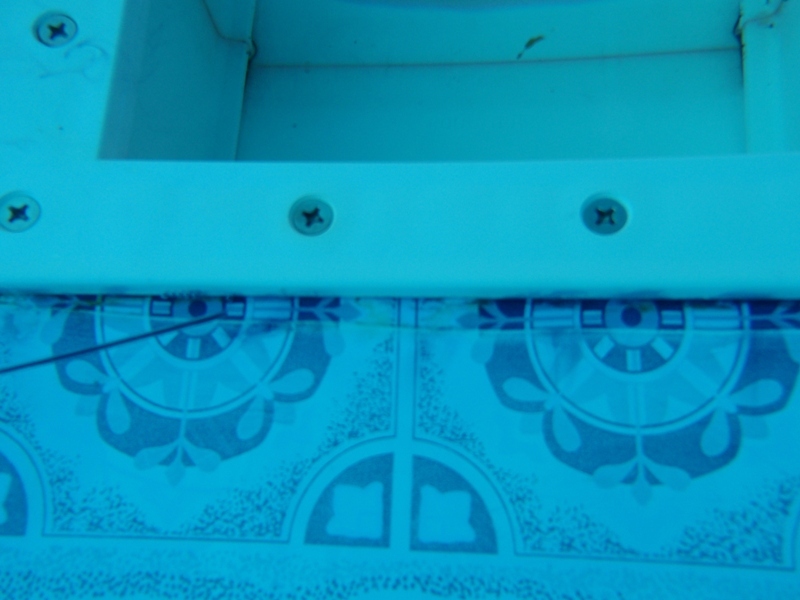 The screws could deteriorate causing a leak. 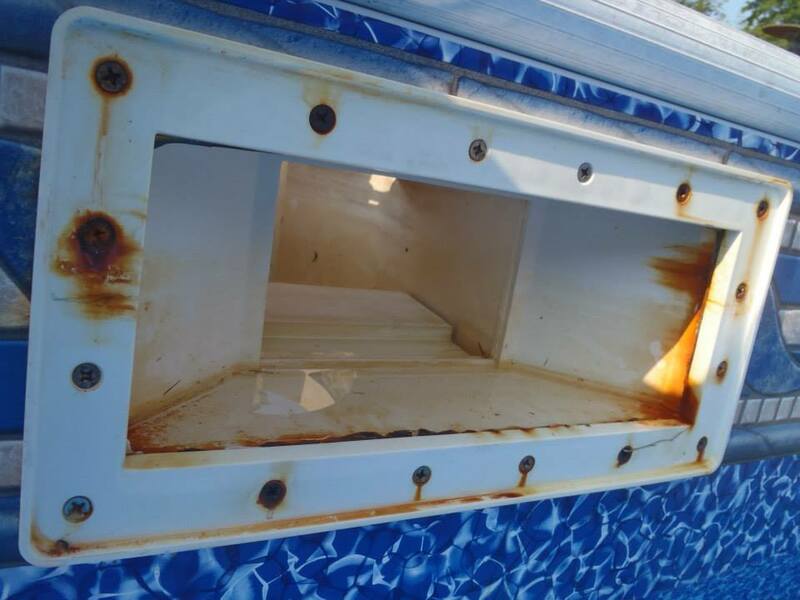 It could also be a gap on the side of the skimmer causing rust from the steel walls. Either way, this looks suspicious. 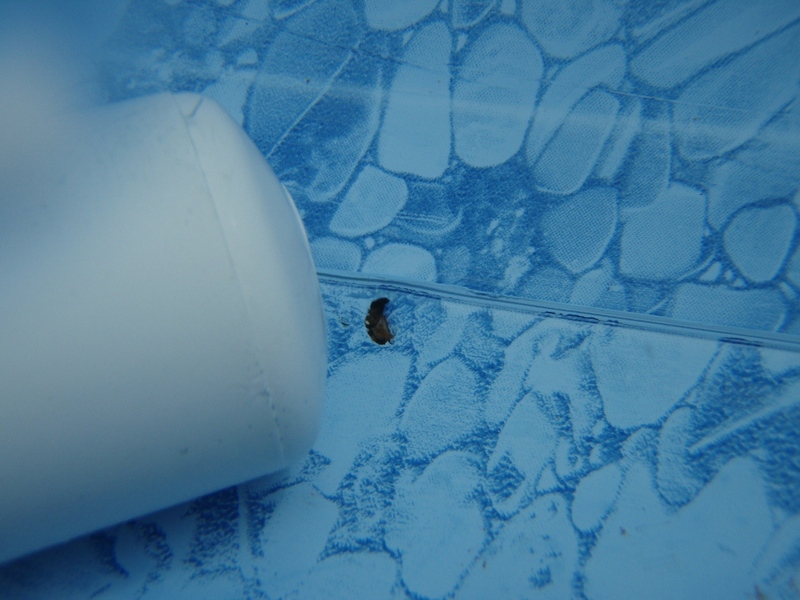 SKIMMER FACEPLATE AREA: Liner is getting old and shrinking. 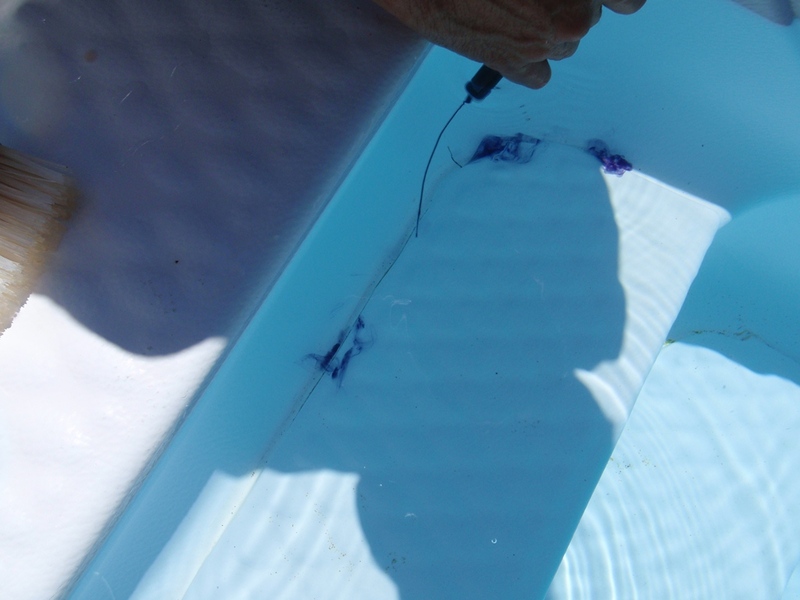 WHITE STEP AREA: Dye test is being performed on a crack in step. Check the following: 1.) Cracks in steps. 2.) Step jet returns 3.) Pulling stretched around step gasket 4.) Pulling away around step gasket corners 5.) 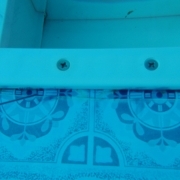 If screws are exposed, look for screw pattern. Check for loose screws or missing screws. 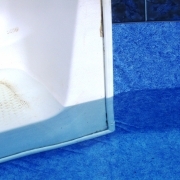 WHITE STEP AREA: Liner floated in shallow end due to drainage issues and pulled away from the step corner. WHITE STEP AREA: Suspicious crack on the corner of the step. 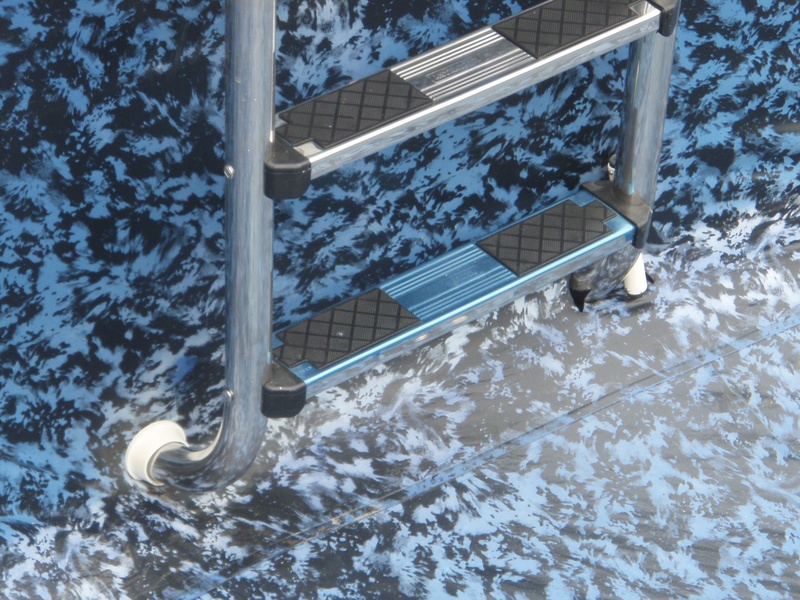 DROP-IN STEPS: If possible, remove them and do a visual inspection around liner. 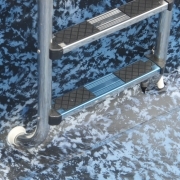 LINER STEPS: A liner covered step is a high traffic area. 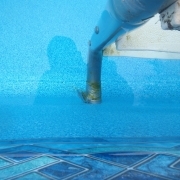 An umbrella blew over onto this step and damaged the liner. (Can you find the damage in the liner?) Check the following: 1.) Check for holes. 2.) 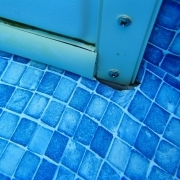 Check for chemical damage that could cause a leak. 3.) Check all of the seams. RETURNS: Broken faceplate possibly due to over-tightening. Check the following: 1.) Check for missing screws. 2.) Loose screws, tighten but not over- tighten. 3.) Visual cracks 4.) Look inside if possible to see anything suspicious. 5.) A missing plug from a known leaking plumbing line that someone removed. 6.) 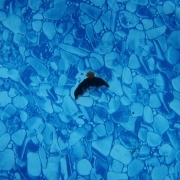 Liner shrinkage. 7.) 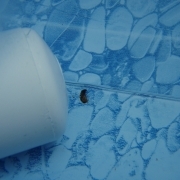 Liner pulling away causing a gap around faceplate. Step Jet: Crack inside step jet return. LADDER AREA: Duct tape should never be used in place of a ladder bumper. 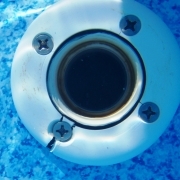 HOLE IN LINER: Most common problem for liners leaking. 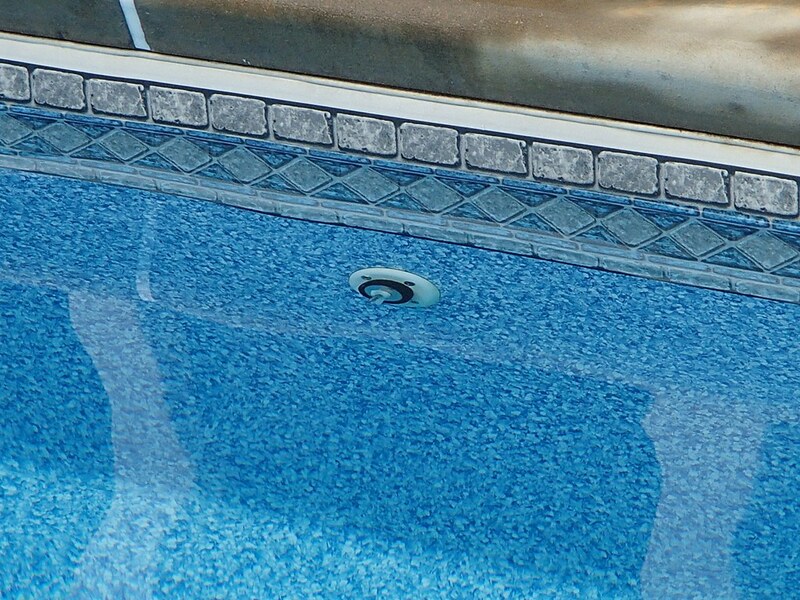 If the pool water level is good after a few weeks after opening and suddenly leaks, it may be a hole or holes in the liner. 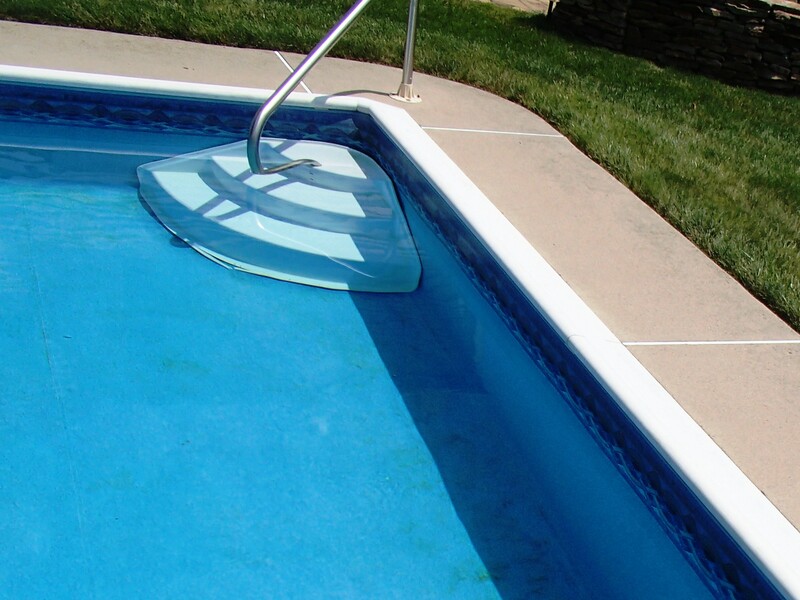 Vacuum pool and balance water. 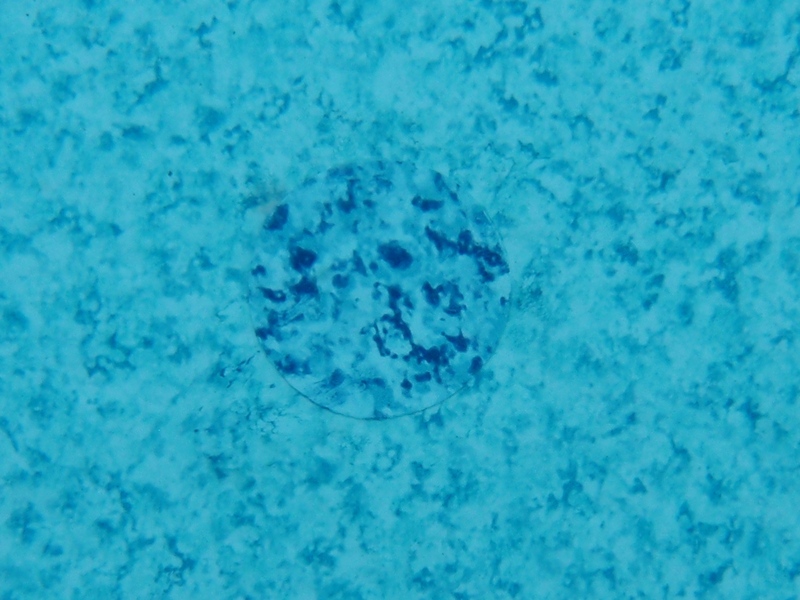 Wear your goggles and snorkel and try to find the hole(s). A hole in the liner can look like a rock that doesn't move. Check for previous patched areas lifting up. 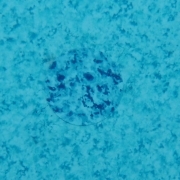 If a clear glass shattered in the pool, the liner must be replaced. Clear glass is invisible and can cause permanent damage to eyes. 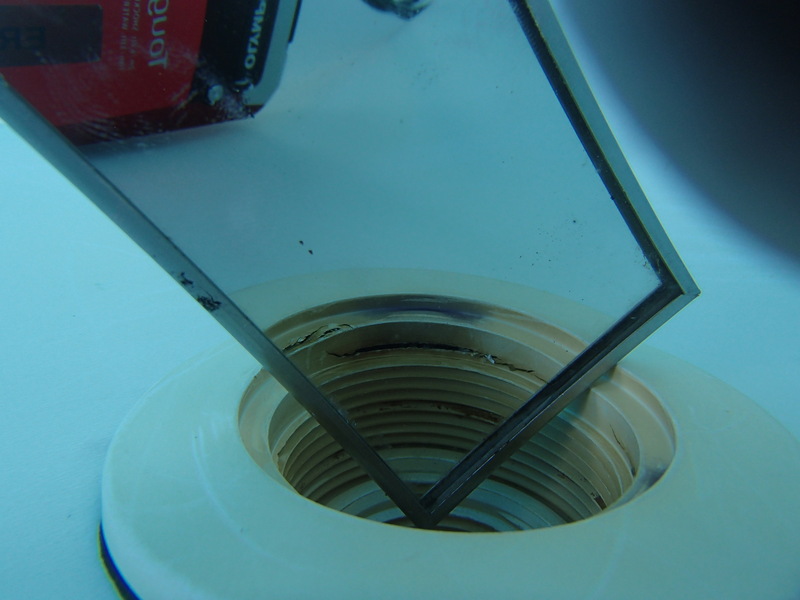 HOLE IN LINER: We see this type of hole a lot. 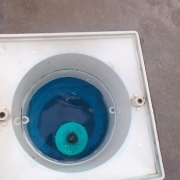 It usually is in the form of a crescent shape from the end of a skimmer pole. 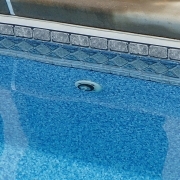 EXISTING PATCH ON A HOLE IN LINER: Check all existing patches. 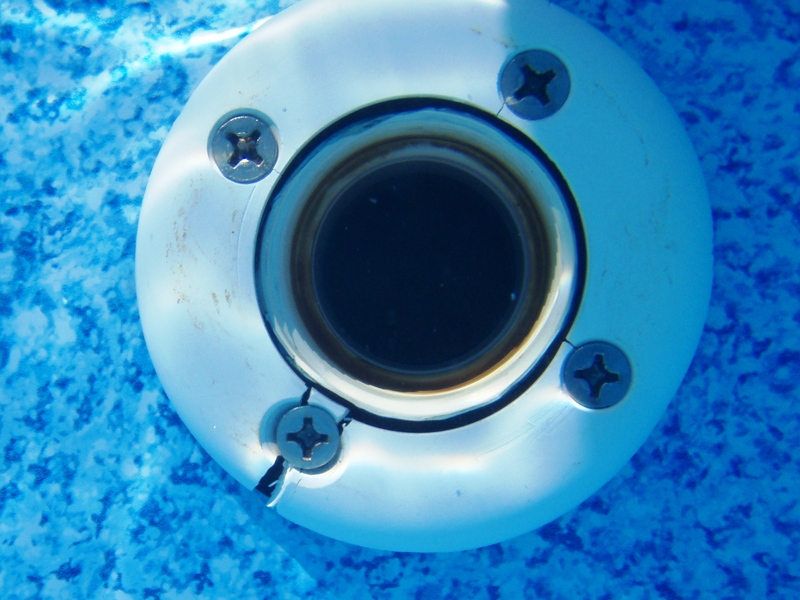 A patch could be lifting up off the liner or missing entirely.